As much a place as it is a state of mind, Capt Hiram’s Resort is the essence of Florida, enhanced with a Bahamian beat. 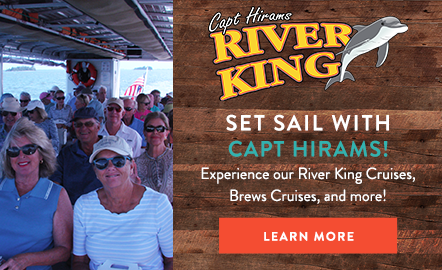 Drop anchor on the shores of Sebastian’s Indian River and surrender to “island time” the Capt Hiram's way. A local fixture, Blackfins at Capt Hiram’s offers Sebastian’s best riverfront dining. Grab a table on our riverfront deck for fresh seafood, including "catch of the day" specials and locally sourced plates. Serving lunch and dinner, this is Sebastian’s favorite spot for delicious island-style favorites, including conch fritters, crab cakes, fish tacos and local saltwater peel n’ eat shrimp. Don’t miss the Dirty Oysters, a Capt Hiram’s signature featuring fresh-shucked oysters served with caviar, sour cream, onions and hot sauce. We are happy to have been voted by OpenTable diners as one of the best restaurants, 2 years in a row! Had supper here Cold beer on tap. Linguine with clam sauce .. then stayed over night .. The room was on the water front and second floor ..Enjoying a beautiful sunrise then breakfast... Of crab cake with poached eggs on a English muffins Absolutely 5 star. Clean updated room with cold A/C, The crew was friendly and helpful and the resort was relaxing and offers numerous amenities to keep you busy. Easy boat access and dockage with great fishing 10 minutes away, cant wait to go back. great food and service. friendly people , live music and a very reasonably priced menu a great time for whatever your up for from a quite sit down dinner to burgers and drinks at the outdoor bar right on the water with a beautiful view ! This place is very nice the music was great along with food. Lots to see and do. Right on the water. They even have a place for children to play. We re had a great time there. We will be back most definitely. We are located one mile southwest of the Sebastian Inlet on the Intracoastal Waterway at Marker 66. For your convenience we also monitor VHF 16.